Ramen noodles won’t be winning any healthy food awards, but you can incorporate them into an overall diet of healthy eating. These Japanese-style noodles, sold in colorful packages in supermarkets everywhere, can become a bit more beneficial with some creativity and common sense. One major common-sense move is leaving out the flavor packet that usually comes with the noodles. A single 43 g serving of Nissan Top Ramen Noodles contains 188 calories, with 61 of those calories coming from fat, a beef-flavored Top Ramen nutritional label says. In addition to the 7 g of fat, each serving gives you 4 g of protein and 27 g of carbohydrates, 1 g each from sugars and dietary fiber. Add the flavor packet and you’re adding at least 861 mg of sodium, depending on the flavor. This comes out to 36 percent of the daily recommended sodium intake, 9 percent of the recommended carbohydrate intake, 4 percent of the fiber, 10 percent of the total fat and 17 percent of the saturated fat. Other brands and flavors vary slightly. A major mark against ramen noodles is the sodium, notes Women Fitness, which put the noodles on its “Top 10 Foods Worst to Consume” list. The noodles’ flavor packets contain anywhere from the beef’s 861 mg of sodium to 3,000 mg in some other flavors. The recommended daily dose of sodium, as per the Dietary Reference Intake, should be no more than 1,440 mg. Another mark against the noodles is they are basically rolled dough that is deep-fried and lack any significant nutritional value. In addition to high amounts of sodium, the flavor packet contains monosodium glutamate, or MSG. The Food and Drug Administration (FDA) gives MSG the nod as an ingredient that is “generally recognized as safe,” the Mayo Clinic notes, but people have sent the FDA reports of some MSG side effects. These include headaches, numbness or tingling, chest pain, sweating and flushing, weakness and nausea. No scientific studies back up these claims, but the Mayo Clinic says researchers acknowledge some people may have adverse reactions to the ingredient. A plus for a ramen noodle diet is the variety of recipes for which the noodles can be a basis. Main dishes, lunches, snacks and soups are recipe categories offered from Nissan, one noodle manufacturer. Choices include ramen noodle pizza, noodle strudel, instant tempura noodles and a south-of-the-border soup. Crushed ramen noodles top a salad listed at Epicurious. Ramen-licious, a site dedicated to touting the greatness of the noodles, offers ramen noodle snack mix, a ramen mayonnaise salad and two recipes including another instant food, Spam. 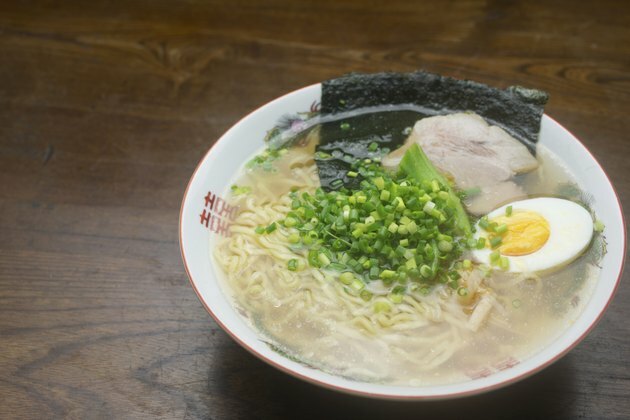 If healthy eating is not a main concern, ramen noodles do have oodles of benefits. They are cheap, with the 43 g package costing less than 50 cents in 2010. They cook in about three minutes. You can enhance the health benefits of ramen noodles if you leave out the flavor packet and mix them instead with healthy ingredients like vegetables, grilled chicken, shrimp or other seafood.